I shall produce a personal E-Book to deliver your personal Psychic Tarot Card Reading to you. Every Tarot reading will help enlighten you in your life using a specific life area spread or general outlook. Alll Psychic Tarot Card Reading E-Books sent direct to your personal email are designed unique to you so that they can be kept forever and referred back to as and when you so wish. This is ideal when a Tarot reading is based on the future, what is to come or given as a gift to someone you love. Ideal as a Birthday Gift or to print out and read in your own time relaxing the Tarot e-Book will certainly lift your spirits and are lovely to keep. 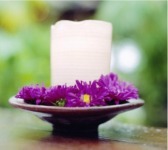 I also perform Psychic Tarot Card Readings for your Baby to see how they will grow up and possible marriage connections, grandchildren or anything else you wish. What a wonderful gift to present your grown Baby in years to come. I am ever improving the Tarot e-Book and very much enjoy personalising them for each and every one of you. No two are the same. You may even have a photo of your Pet if you requested a reading on your dog, cat, or other creature in your family! Many of my Psychic Tarot Card Readings revolve around Love or Marriage and are designed with the enquirer's thoughts in mind and what they specifically wish answered. For the more eclectic Psychic Tarot Card Readings such as The Bohemian... very colourful and enlightening to many. and The Tree of Life. you will find it inspiring and illuminating... opening up new doorways into your life. Self Psychic Tarot Card Readings can help develop your sense's and improve your general wellbeing. 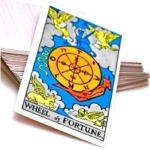 Thank you for viewing the example Psychic Tarot Card Reading page, why not now browse my Psychic Tarot Card Readings here.